I just started a four week workshop called Designing Textiles for Fashion: Women’s Activewear through the Pattern Observer. Every time I say “activewear” I have to sing it just like this. I am one of those people who wear activewear for working out, pretending I’m going to yoga class as well as binge watching Netflix. As an avid athleisure consumer, I think it is important to learn about this niche textile market. In the first part of the course, we are learning about trend identification. I’ve been checking out the looks coming down the runways right now and have come up with some fun and funky trends. The first trend I noticed is, and I’m not kidding, cats. Stella McCartney, Dolce & Gabbana, Gucci and others are strutting their fierce feline stuff. See it to believe it on my Cat Fancy Pinterest Board! 40 is the new 30, navy is the new black, and cats are the new owls. Now the challenge is to take this feline inspiration and translate it into some patterns for the activewear market! Stay tuned for two more trends from the 2016 runways. I’m doing a new challenge over at the Textile Design Lab to create a collection to add to my portfolio. The theme is Earthed and I’m a little out of my comfort zone with these colors. But I’m up for the challenge as comfort and growth aren’t really besties anyway. So I’m heading into the woods to see what I can create. I’ll keep you posted. At long last, I have put together a small collection of patterns based on my mood board! It has been nice to channel a sunny, bright and warm locale in the middle of winter here in the Pacific Northwest. Send Me To Santorini. No seriously, send me. I will admit I am a mood board junkie. I love to make them myself and I love to look at those of others. The mood board phase of my process is where I come up with some of the references, textures and trends I will use for my collection. This is also the time that I develop my color palette. 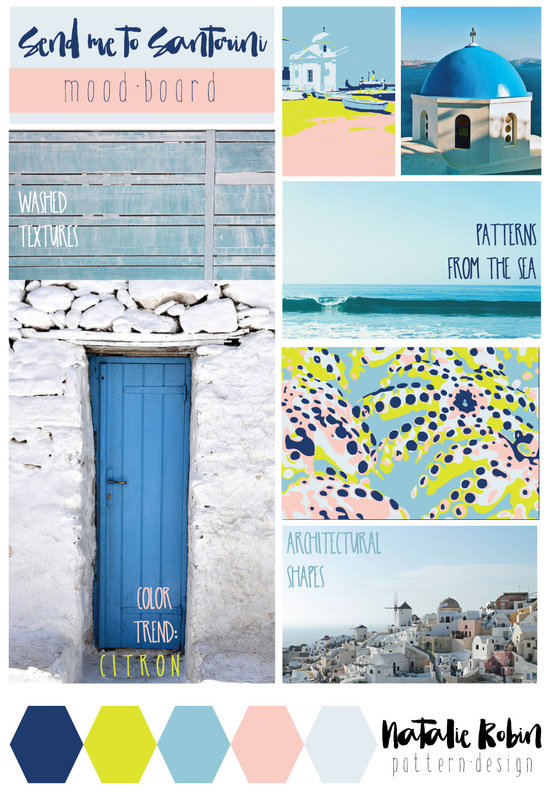 Semi-side note- one of my favorite ways to create a color palette for a pattern is to take some beautiful photos from my destination inspiration and pull colors directly from the photo using the eyedropper tool in Adobe Illustrator. This probably sounds odd, but I feel that process lends some authenticity to my work- like somehow I’m being true to my inspiration by using the actual color captured there. I also want to share two amazing resources for creating beautiful mood boards: http://www.unsplash.com and http://www.jaymantri.com. These two websites create and curate gorgeous high resolution photos that are under the Creative Commons Zero license which means you can copy, modify, distribute and use the photos for free, including commercial purposes, without asking permission from or providing attribution to the photographer. I always like to attribute though, when I can. Artist honor code. Picking a destination helps guide and drive my design process. I use it as a loose framework from which to draw inspiration for the colors, shapes and textures in my designs. How can I reference unique architectural, landscape or cultural details? How can I convey the overall feel or mood of this location? 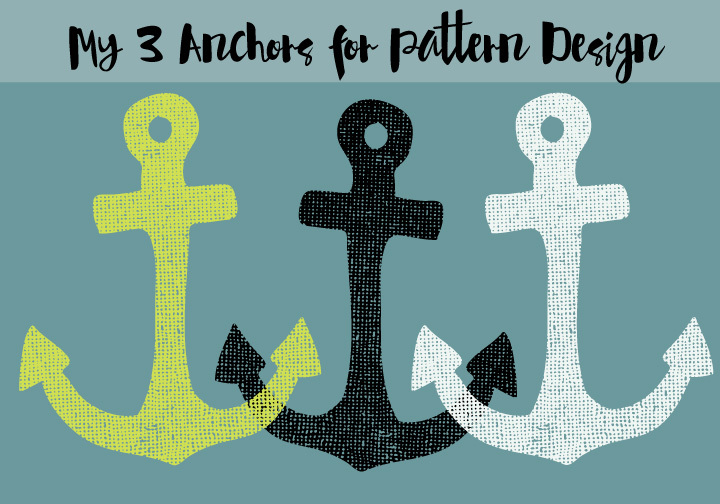 Participating in the Textile Design Lab at the Pattern Observer, I learned the importance of the other two anchors, researching upcoming trends and defining an ideal customer. Researching and incorporating trends is essential, a dash of deconstructed geometry or a pinch of primitive motif keeps the designs fresh and relevant. Finally, I always create an ideal customer for my collection. This customer even gets a name, I know her personal style, what her house looks like and even where she shops. Definitely bordering on creepy stalker- if she were real! When designing a collection, I constantly ask myself WWSB. What would Sophie (or Sadie or Suki) buy?